Jason Richardson has been involved in elite sport for over 20 years, firstly as a track & field sprinter (100m – 400m), then as a sports broadcaster in various radio & television capacities. He started his journey into elite sport by winning the 1993 Stawell Gift, and has the record of being the only athlete in 130+ years of this iconic event to win the 100m / Stawell Gift / 120m Backmarkers events in successive years. After winning the Stawell Gift, he raced at national & international level at 100m – 400m distances, and won the 1996 British Professional 200m Championship. Once retired as an athlete, he pursued his passion for sport & the media, initially working with world leading eyewear company, Oakley, as Asia Pacific Sports Marketing Manager for 6 years, before founding his own importing & retail business which was developed to a point to being sold to a Publicly Listed Company in 2008. 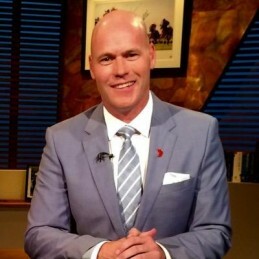 His sports media career started in 2000, with Channel 10, initially as guest reporter on Sydney 2000 Olympics, then as host / reporter with Inside Sport TV. This lead into being a foundation host of new 24 hour Melbourne Sports Radio station SEN-1116 in 2003, and has worked extensively on SEN hosting all the key daily programs, plus their feature coverage of AFL Football, Spring Racing Carnival, Track & Field, Cricket etc..
Jason’s love of thoroughbred racing started in his very early childhood, through his family’s involvement as Trainers & Jockeys in Tasmania, highlighted by Sunny Lane running in the Melbourne Cup before placing in a Hong Kong Vase, owned by his uncle, John Best. Therefore, in 2007 the opportunity to work with ThoroughVision (TVN) was a perfect combination of Jason’s sports media background and his love for thoroughbred racing, as a host/presenter of race day TV coverage and other feature programs.